Seeing blood in your mouth and around your gums can be a troubling sight. Bleeding gums can be a sign of a number of things, while some are of no real concern, you still need to seek dental advice to ensure it isn’t a sign of something more serious. So, here are the top causes of bleeding gums. This is an extremely common cause of bleeding gums, and it requires immediate attention by a dentist. Gingivitis is the first stage of gum disease, and while it is easily-treated, if it is allowed to progress you may end up with advanced gum disease and periodontitis. Periodontitis unlike gingivitis is extremely hard and uncomfortable to treat and can result in loss of jawbone density and loss of teeth. All forms of gum disease are caused by poor dental hygiene, lifestyle factors, genetics and systemic conditions, such as diabetes. Bleeding gums during pregnancy are extremely common and nothing to be worried about. Hormonal changes cause the gums to swell in response to the presence of the bacteria that creates gum disease. In most cases, this subsides following pregnancy, but you should visit your dentist to ensure the bleeding is only a hormonal response and not a sign of any other dental problems. Maintaining a healthy dental routine is essential during pregnancy, as the immune system is compromised and you will be more susceptible to infections and decay. Some medications thin blood, which can cause bleeding gums. 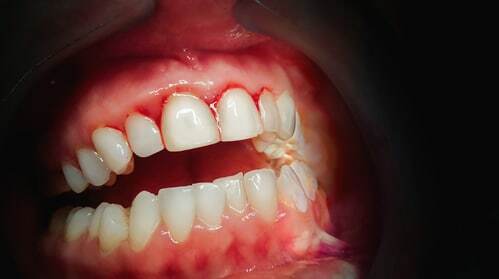 Bleeding gums will usually be listed as a possible side effect of any medication that is associated with this condition so consult packaging if you’re concerned. Your dentist should also be aware of any medication you’re on, so it’s a good idea to bring a list along to your next visit. A new toothbrush or a change to the way you floss could create bleeding. If you were an infrequent flosser and have started doing it daily, there is a chance your gums will bleed. This doesn’t mean you should stop flossing; it just means that your gums aren’t used to such frequent cleaning. The bleeding will subside, so stick to it, because a little bleeding is much less severe than food particles and plaque in between your teeth. If a medium or hard toothbrush is creating bleeding when you brush, switch to a soft-bristled brush. Bleeding may also be a sign that you’re brushing too hard, so talk to your dentist about changing your technique. If the bleeding isn’t a result of a change in your routine, it may be a result of your routine being inadequate. Everyone should be brushing twice a day and flossing at least once a day. If you’re still struggling to stay on top of decay or gum disease, you should consider switching to an electric toothbrush and add an anti-bacterial mouthwash to your routine. A key part of your routine should be a bi-annual visit to your dental hygienist for a professional clean. This professional clean is essential in keeping your gums and teeth free of the plaque and tartar that can cause so many problems. A poor diet that is full of sugary and acidic foods, as well as other factors such as smoking and excessive consumption of alcohol, can also cause bleeding gums. Health is intimately connected, so the health of our teeth and gums is related to the things we consume. Take care of your body, and it will take care of your gums. If you’re leading a hectic lifestyle, the stress may also be contributing to bloody gums. Stress and anxiety affect our immune systems, so our gums’ ability to ward off infection and inflammation is compromised. If your bite isn’t balanced, for example, you have an overbite or underbite, excessive force and stress will be placed on certain parts of your mouth. Bleeding gums may be a sign that you need to visit your dentist for some corrective orthodontic work. If you’re worried about braces or plates, you’ll be pleased to know that technology has made orthodontic techniques far less obtrusive. You even have the option of Invisalign, which is a completely invisible form of braces that will correct your bite without the fear of potential public embarrassment. Bleeding gums isn’t something to be terrified of, but it should inspire you to visit your dentist. Our body has ways of giving us signs on our health, so get along to your dentist to see what your bleeding gums are telling you.